Every Nick Cave gig I have been to – and there have been many – feels like this. 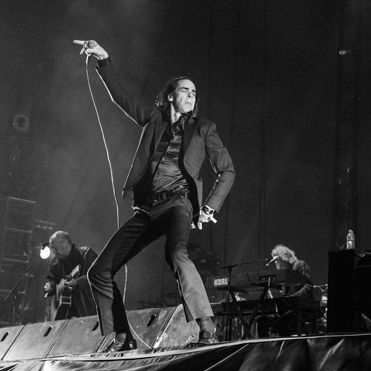 How transcendent were Nick Cave & The Bad Seeds on Thursday night?Let’s put it this way: there are singers who are passive, who prefer to stand behind a microphone and let their voice do all the heavy lifting, and there are singers that work the stage with a touch of athleticism and a strong helping of charm and charisma. And then there’s Cave, the restless renegade Australian with his roguish baritone who fearlessly thrusts himself out into his admirers, venturing eight to 10 human rows deep, grabbing hands and beckoning his audience to join him on this animated two-hour journey as if he’s trying to absorb them into his very skin. This wasn’t a gimmick or a one-time ploy: as Cave and his six Seeds twisted the Sony Centre for the Performing Arts inside out with a riveting performance that veered wildly between soft sentiment and eardrum-decimating fury, the dark-haired singer repeatedly ventured as far as his microphone cord would let him, staring deeply into the faces he was serenading and ending songs like “Tupelo” and “Stagger Lee” perched on top of a seat hundreds of feet from the stage. Although his songs reference religion as often as romance, his public pulpit finds him playing the role of master storyteller. And Cave knows his own music so well that he adds dramatic impact through his body language. Cave wasn’t the only engaging performer worth his weight in performance gold: the Rasputin-like fiddler and flautist Warren Ellis had a few tricks of his own, like tucking a bow into his shirt collar while plucking his instrument then withdrawing it from behind his neck to revert to bowing. Ellis also sent the occasional bow sailing into the Sony Centre rafters, replacing it with a new one whenever the arrangement called for it. Cave also won brownie points by refreshing his arrangements so they weren’t carbon copies of the record: “From Her To Eternity” took a more aggressive stance, and “Jubilee Street” exploded into a fire of calamity and cacophony about halfway through the number, thanks to the adept accompaniment of Bad Seeds Ellis, drummer, keyboardist and xylophone player Barry Adamson, drummer Jim Sclavunos, keyboardist Conway Savage, guitarist George Vjestica and bass player Martyn Casey.As newer tunes like Push The Sky Away’s “Higgs Boson Blues” and vintage numbers such as “Papa Won’t Leave You, Henry” reminded the crowd of Cave’s extraordinary knack for incorporating rich imagery and master storytelling within a song, they simply couldn’t get enough of him, remaining on their feet the entire show, applauding and cheering him on and eventually being rewarded with a pair of well-deserved encores. Nick Cave is one of those exhilarating, show-stopping performers that should be mandatory study for anyone considering a career in music performance and added to everyone else’s “must-see” list.That’s why this show warranted the extra star added to its rating: Cave and his Bad Seed brethren earned it. via A Nick Cave concert so riveting, it gets five stars out of four | Toronto Star.